Home » 300 , movies , rorschach , watchmen » CONFIRMED: Rorschach is REALLY gazing back in new 300 trailer! 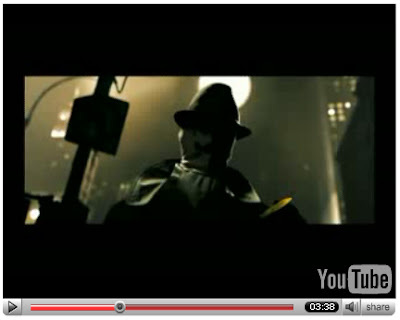 CONFIRMED: Rorschach is REALLY gazing back in new 300 trailer! Rorschach is holding the Comedian's blood-stained smiley-face button, just as he's depicted doing in the first few pages of Watchmen. This is really... well, quite astonishing. I really don't know what else to say. I wasn't quite 16 years old when I first read Watchmen and it completely blew me away. Watchmen is easily on my personal top ten list of favorite books of all time (with Number One being the Holy Bible and Number Two being The Lord of the Rings, Watchmen probably ranks ninth or tenth... but that's still good). I've probably read that book at least 20 or 30 times over the years. And from the very beginning, I have always wondered, more than anything else from this book: "what would Rorschach look like in a live-action movie?" Well, there he is: "the abyss gazes also..." Now I just have to wonder about who in the world is going to play this psycho.